I am using Windows 10 64 bit with the latest Netcam Studio x software. 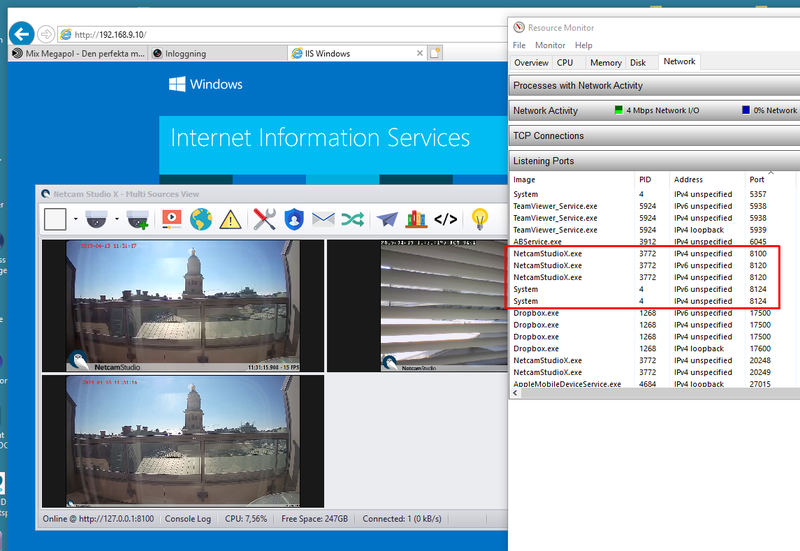 I want to use Windows IIS to put a couple of web pages on line with my IP and USB cameras imbedded in the pages. I have found that NSC works perfectly well until I install Windows IIS following which the next time I reboot the computer NSC no longer detects either of my cameras. The NSC window shows no data, Add Source doesn’t work, Access Control shows no users and the Event Logs is empty. In order to get NSC working again I need to unload IIS, completely delete NSC then reinstall it. I have tried both 32 bit and 64 bit versions of NSC. Both behave in the same way. Any suggestions/ideas please? I am running Win 10 Pro IIS and NCS X with no problems also after reboot. NCS X use ports 8100, 8120 and 8124 to work. Check that with Resource minitor so no other programs use these ports. However, if you do a reboot, like a crash, without closing NCS X with an Exit before reboot it may very well cause some problems since some config files might be open for reading/writing. Running NCS as a service should close NCS properly when a reboot is made. I have followed your suggestions about the ports. I didn’t have port 8120 open. Resource Monitor shows nothing else is fighting to use these ports. I was using Netcam Studio x but you suggestion about running NCS as a service seemed like a good idea. I have rebooted my Pc a few times – I am finding it difficult to type with crossed fingers – but so far all seems well. I am most grateful for you prompt and very helpful reply.